The RAC05 dash cam records in Super HD quality which is better than HD quality. There is also a 2.7-inch TFT LCD screen to playback recorded video. Speed camera warning and vehicle tracking is also included utilising the devices GPS capabilities. The dash cam 05 will record your speed and GPS location. Parking mode is also included to record videos whilst your vehicle is parked. The viewing angle of the Dash Cam 05 is 150 degrees. RAC05 Dash Cam dash cam has been discontinued. 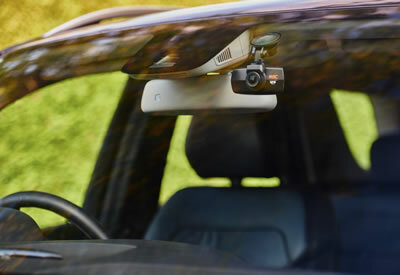 The RAC05 dash cam records video whilst you are driving. By using the RAC dash cam in your vehicle you can also save £30 on you car insurance when you buy car insurance from the RAC. 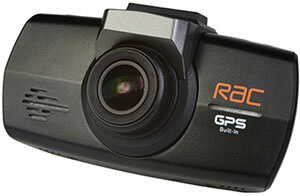 The RAC05 dash cam includes GPS technology to record your location so you can view your journey on a computer using Google Maps - your speed and location will also be saved to the RAC dash cam device. The RAC05 records in Super HD with a resolution of 2340 x 1296 and it comes with an 8GB memory card. You can upgrade the memory card to 64GB in size. The RAC05 has a 2.7-inch TFT LCD screen (960 x 240). You can playback video instantly using the devices screen. You can also set the screen to remain on or you can set the screen to automatically turn off after a short while of not being used which is ideal if you do not want to be distracted whilst driving. For you reference, when recording in Super HD quality the RAC05 will record in segments of 3 minutes. 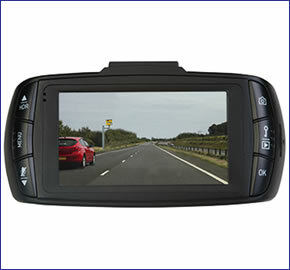 The length of each segment can be adjusted using the simple menu functions on the dash camera. When recording a 5 minute video takes up 1GB of space on the SD Card. The recordings made with the Dash Cam will loop record (record over old video) which means you get continuous recording. Parking mode is a feature of the RAC05 so you can record whilst you vehicle is parked. There is also a G-Sensor that will record G-Forces experienced along your journey. A speed camera database is also included with the RAC05 dash cam which which includes distance to camera, speed limit for the road and your current speed. Forward collision warning also alerts you if you are driving too close to the vehicle in front. Lane diversion warning furthermore tells you if your vehicle drifts over the white line in the middle of the road. An overspeed warning is also featured whereby you can set a predefined speed and if you exceed this speed you will receive a warning alert. The RAC dash cam is enhanced for night vision. There is a powerful Ambarella AL750 chip that enables all the features of this dash cam to work. The lens on the RAC05 is a Full 6G +1IR and includes a 4 megapixels sensor. The viewing angle of the dash cam 05 from RAC is 150 degrees. The battery lasts for 20 minutes. There is also a photo mode on the dashboard camera. A built-in microphone also enables you to record sound whilst recording video - this can also be set to mute if you do not want to record sounds. The dimensions of the RAC dash cam is 10 x 3 x 5cm. Do you have a question about the RAC05 that's not been answered on this webpage? Please see our Dash Cam FAQ's for questions from other people. If the answer to your question isn't featured, use the online form to ask us for the answer. Alternatively please telephone 01733 777623 Monday to Friday (9:30am-5:00pm) to speak to one of our sales team. The RAC05 has a car charger to power the in car camera device. A windscreen mounting bracket is also provided. The mount allows you to turn the device 360 degrees.